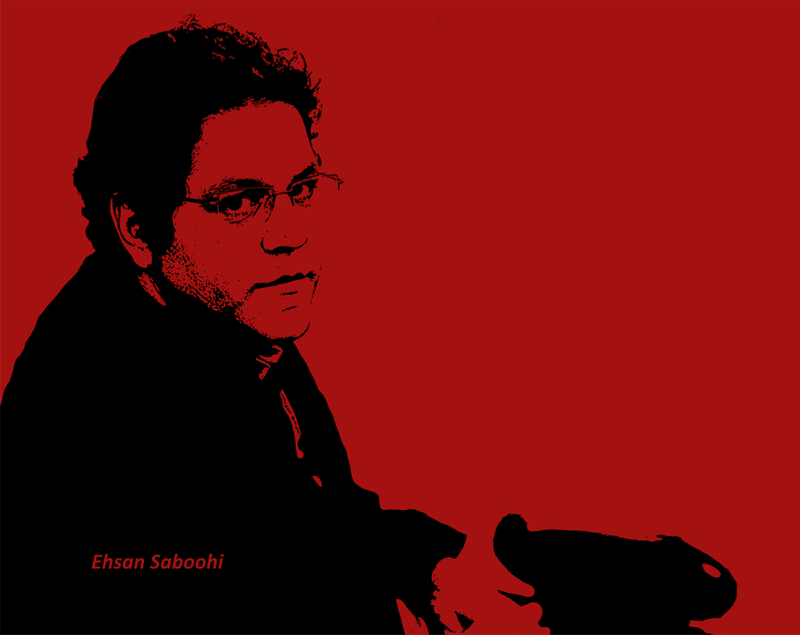 We are delighted to provide the wider international release of Iranian composer/electronic musician Ehsan Saboohi’s Chaos in the Cosmos. The album is available as a digital download and comprises two fascinating experimental tracks, microtonal and hypnotic, weaving tapestries of sculpted sound. 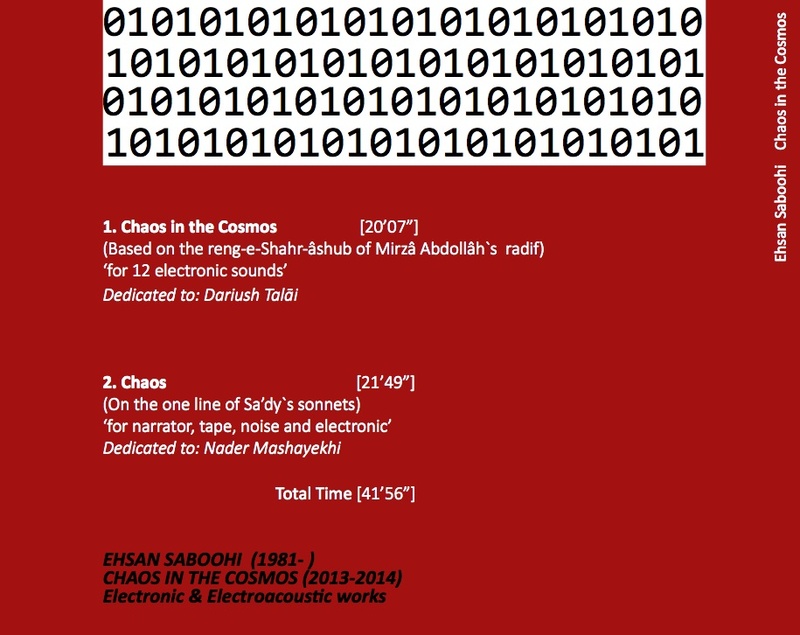 From Mr. Saboohi: “Chaos in the Cosmos” (Shahr-âshub in Persian) is an experimental music inspired by the well-known components of Iranian culture such as literature, miniatures, calligraphies and the art of carpet. 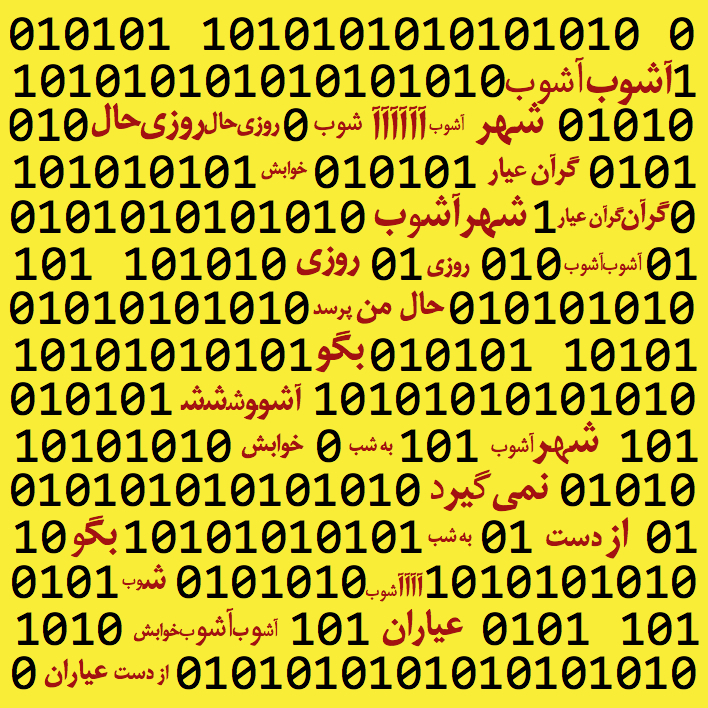 Being aware that meta narratives have no place in today’s world, it is aimed to be a micro narrative of the Persian traditional poetry and music. Chaos (Âshub) is a metaphor for the invention and discovering the new disciplines and Cosmos (Shahr) is a metaphor for the established disciplines. We respect other nations’ music and believe that what constitutes the future of the music is a dialogue between the contemporary and traditional music. Thus, we look at the western music from the second half of 20th century (from1950 onward) and consciously bracket all the appeal of tonal music in order to rediscover the harmonics and non-harmonics of the music by itself. The Digipaks of Joe Evans’ compelling new Spectropol release are here and ready to ship. Designed by Evans, the CDR packages are very attractive and sell for only $11 plus shipping (includes digital download). The third installment in Spectropol’s microtonal compilation series, this collection is another highly varied snapshot of current xenharmonic practice from international artists. As with the previous albums in the series, the stylistically diverse tracks here explore just intonation, equal divisions of the octave, mixed tunings, fretless instruments, and extended playing techniques. The music here ranges from chamber ensemble spectralism to catchy electronica, from surreal soundscapes to strange funk, intimate classical guitar work to electric feedback, and from free improvisation to evolving drones. With contributions from Taylor Brook, Paulo Chagas, Brendan Byrnes, Susan Ann Brewster, Greg Hooper, Jon Lyle Smith, Agustín Castilla-Ávila/Giacomo Fiore, Elis Czerniak, MonoNeon, Ben Wylie and Peter Nagle. We hope you enjoy this playlist as much as we do; please share widely! Spectropol Records is delighted to announce the release of Septimal by UK composer Joe Evans. A 46-minute album available as a Digipak CDR and high quality download, Septimal features fourteen superlative tracks that explore the sonic and expressive potential of the autoharp. Joe Evans writes: “While I initially conceived of Septimal as a study of microtonal harmony, it has developed into something far more complex and personal. The word Septimal, meaning “Pertaining to all things Seven” is not widely used outside of the world of scales and temperaments, where it refers to intervals derived from the 7th harmonic. These intervals are often poor relations of intervals derived from the 3rd & 5th Harmonics, fighting for space on an otherwise occupied keyboard. By removing any notes derived from the 5th harmonic, the space opens up to allow the character of septimal intervals to shine, a coup within the harmonic series, perhaps? Septimal was created from recordings of improvisations on the autoharp. Each piece attempts to explore the nature of the scale as well as the character of the instrument. Each note (string) is independently tunable, making it ideal for experimental scales. In Addition, the instrument lends itself to other experiments, exploring sonic possibilities such as taps, bumps, string scrapes and other mechanical noises of the instrument that make up so much of its character. This has led to a number of pieces where the tuning is far less relevant or even obscured, although always present. From the early stages of this project, a potential narrative became apparent, hinted at in the track titles. While I think this is better left open to interpretation, themes of abuse, tyranny and war are clearly stated. Stream or download it now! CDR ships May 20.
new Rubio album is out! A fascinating collection of de/re-constructed experimental pop tracks from Marcus Rubio. ‘desolation’ is an album of sonic hauntings, a collection of experimental ambient explorations by two longtime collaborators. This release continues Spectropol’s side project of unearthing older gems from the back catalogs of interesting artists, as these tracks were recorded in 1999. 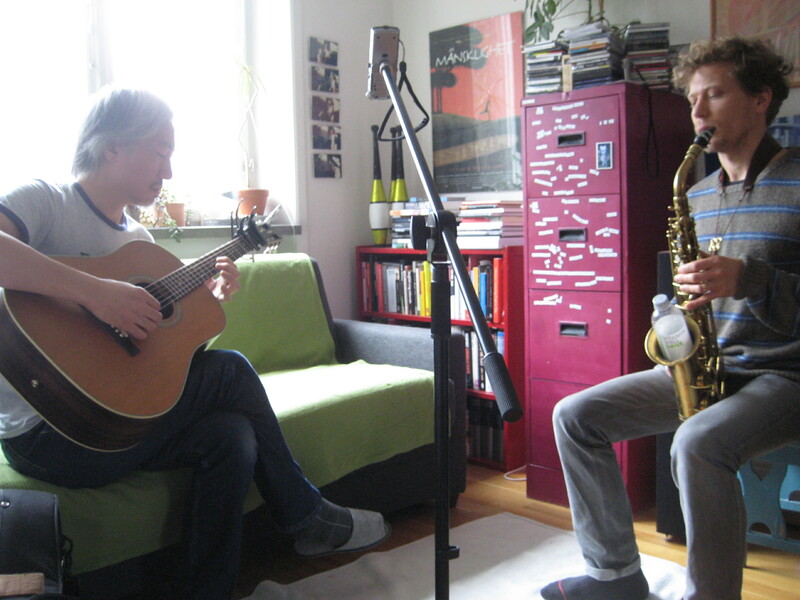 Bennett and Galloway have since collaborated many times, recently in the west coast based psychedelic-electroacoustic band Respectable Citizen. ‘desolation’ has aged wonderfully, with composer Bennett putting his considerable synthesis & keyboarding expertise to use against Galloway’s trademark experimental guitar work. It’s full of force and beauty and beckons new listeners in 2014. Excellent thorough review of La Géographie Sans Regret from the fine folks at The Sound Projector. You may be excited to hear that a new edition of this album…remastered and with added bass…is coming out next month alongside a wonderful new collaboration from Christian (Brazil) and Mehata (Japan) with the great Paulo Chagas (Portugal). Polish artist Marcin Tomczak has been producing music and sound art for well over 15 years. His early work involved audio collage, as well as programming early drum machines and the Commodore computer. His BRUIT project (late 1990s) mixed spoken word poetry with sound collages. He then began mixing and composing with various sound sources under the alias LIL. The hypnotic, ambient music on THE SPACE BETWEEN was completed in 2013 and combines field recordings with subtle electronic textures and processed voices. LIL frequently collaborates with other artists and has an upcoming solo release on Tom Flesh Records/Sirona Records in the first quarter of 2014. Stream, download (name your price), or purchase the CDR from the bandcamp link.